There was a time when there were no shotgun instructors. Optimum Shotgun Performance Shooting School did not exist. There was no Gil and Vicki Ash. Yes, that’s a frightening thought, we know, but it’s true. Back when we started competing in sporting clays, not only did we have to watch out for wooly mammoths and saber-toothed tigers, we also didn’t have anywhere to go for shotgun lessons. There were no instructors. At that time, the way of learning was to go hang out by the range house when the other shooters were congregating, hoping you could pick up something from somebody who was a better shot. Many of the shooters would stand around and exchange information, sharing their common experiences. It wasn’t as efficient or focused as going to an experienced instructor; some shooters just weren’t good at instructing others no matter how well they could hit the targets, but, many times, there was also something magical about that pooling of knowledge. Although ice ages have passed since then, it was that clubhouse magic that we were attempting to harness when we created the Coaching Hour call-in show. We hoped to create a discussion with group participation instead of a one-way lecture. Sure, even some of our students wondered if it wasn’t just a way for us to B.S. for an hour and get paid, but we held onto our vision and began hosting the monthly shows in November of 2001. The magic we were hoping for happened immediately. The shooters and instructors who have joined us on the Coaching Hour have expressed their astonishment at the sheer volume of information that is exchanged in a single hour, and at what an amazing learning tool the show has become. As instructors, we’ve learned an immense amount as well. The Coaching Hour has pushed us to constantly research the best avenues to peak mental and physical performance in sporting clay, and in life itself. It has been a great motivator to find new ways to talk about the same basic concepts. In partnership with the other shooters on the Coaching Hour, as we all find more ways to describe these concepts, the light bulbs begin to switch on in many more heads. The show has become a very structured and focused way of capturing the magic of a range house discussion. The format allows us to condense the best aspects of those conversations, while whittling out the unnecessary or unimportant jibber-jabber. It also provides immediate feedback. For example, many of our students don’t have time to call in and listen to the show on Tuesday nights. But they can’t wait to get the CD to listen and learn about what we talked about. Others might be trying something we gave them in a clinic, and if they are confused and having trouble putting it into effect, they can call us up and we’ll talk about it on the Coaching Hour. Other shooters who may have overcome that same obstacle can contribute to the discussion and shed new light on our instruction. In another big discovery, we found that although the shooters were listening carefully during the live show, they wouldn’t internalize it until they had listened to the recorded CD of that Coaching Hour several times. And every time they reach a new level, they interpret what was said on that Coaching Hour differently. 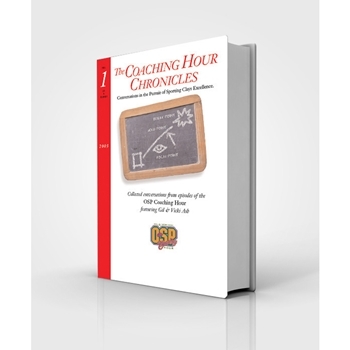 That’s why we decided to put the Coaching Hour transcripts into print, starting with this book, which covers the first year. Here, we invite you to share in the insight, humor and inspiration of our round table of shotgun shooters. And should the urge strike you, pick up the phone and give us all a ring, because the conversation continues.